Now into the final third of the 2018 season, we’re thinking those northwesterly winds we were praising in late June can let up already! We’ve had 2 weeks of steady northwesterlies now and are ready for a change! 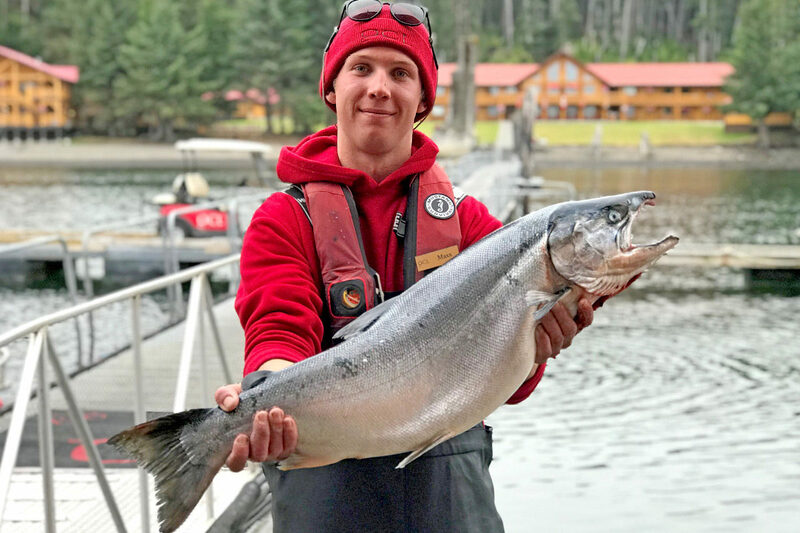 Anglers and guides are looking forward to getting back offshore with easy access to the fantastic bottom-fishing and large schools of Coho passing through the area. This week we’ve seen excellent Coho action with the larger-sized fish we expect in August. Double-digit sizes are pretty common now with several fish in the low teens showing up. Paul C, fishing with guide Max Peiffer, picked up this stunning 16-pound Northern while trolling at 37-feet in front of Bird 2. Fish like this one are always on the bucket list of any salmon enthusiast! It’s been an excellent Coho season for us with large numbers being found in the offshore waters, generally down 30 to 60 feet and hitting anything from anchovy set-ups thru spoons and hoochies. At the same time we’ve been quite successful throughout July finding considerable Chinook salmon in the same offshore areas, just deeper at 60 to 100 feet. And occasionally we get a surprise, like the 42-pound Tyee landed by Driftwood guest John C last week, while trolling for Coho in 220-feet off Shag Rock! It goes to show you have to be prepared for anything when fishing up here! The weather is about to change for this weekend with winds shifting today around to southwest and then rising to southeast overnight. They’re forecasting some fairly breezy conditions for Friday and Saturday so we’ll be spending some time over at Cape Edenshaw this weekend. The upside is that those shorelines have seen very little fishing pressure with all the northwest so it could be very productive! Look for an update on Sunday. After the weekend it looks like we’ll enjoy a nice stretch of light variable winds right through the middle of the month! We’ll be ready for them!